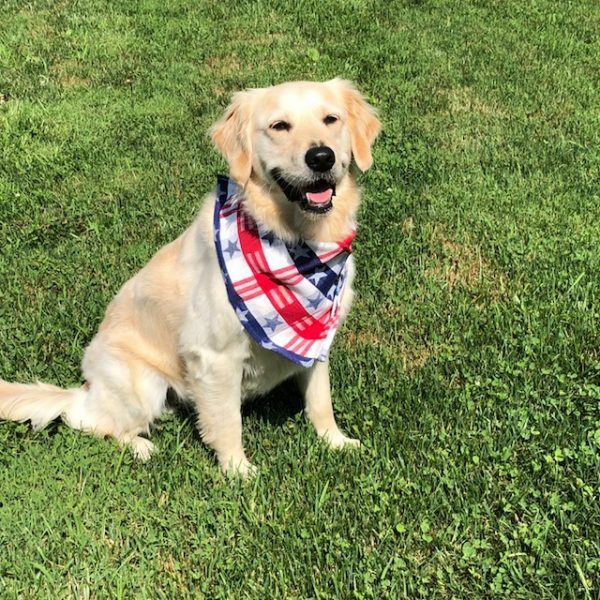 Hi there, it’s Sugar here, and I wanted to share with you some tips that may help make this 4th of July less stressful for your dog. I know you’re probably focused on what to cook on the grill and wondering if you have enough floating noodles for the pool, but most of us with 4-legs aren’t as excited about Independence Day. I wanted to remind you to take a few minutes to think about how unsettling fireworks can be to your 4-legged fur kid and share some ways that may help minimize their stress. We all agree that fireworks are extremely loud! It’s one of the reasons you humans love them. But we have a more acute sense of hearing and they often startle us. Our instinct is to be fearful since we perceive it as a possible threat. We may move in a little a closer to you or head to a place where we feel safer. Sometimes your reassurance is all we need, but sometimes we need a little more help. Mom works on getting us ready a few days before the 4th by playing a You Tube video of noisy fireworks while we do some of my favorite things like tossing the ball, brushing my beautiful fur, practicing my tricks and giving me yummy treats. She says she is desensitizing me. All I know is I like the attention even if I don’t like the sound of the fireworks. We have a dog that stays with us for “Bed & Biscuit” care that gets swaddled like a baby human to help keep her calm. Mom calls it a Thundershirt. When the fireworks start, we head downstairs, to the quietest part of the house, and I hear Mom say, “Alexa, play some calming music for dogs” and then she gives us a tasty bully stick and we hang out together. Mom also turns on the diffuser and the room smells like lavender. This all works for me but If you think your dog needs more help getting through the 4th, check with your veterinarian to see what options are available. They might even recommend trying something over the counter like Benadryl to see if that takes the edge off before prescribing medication. Good luck and have a safe and less scary 4th of July celebration this year!